Members of the SketchUp gang just got back from K/BIS 2009 in Atlanta. K/BIS is the annual Kitchen & Bath Industry Show & Conference, and it's HUGE – miles of glitzy trade show booths, stuffed with fancy appliances and staffed by attractive spokespersons in uncomfortable heels. The five of us stood out like sore thumbs, but we like it that way. We brought a small booth to show kitchen and bath folks how they can use the goodies in SketchUp Pro 7 – and LayOut in particular – to convince their clients to use their design services. We also made a lot of great contacts from product manufacturers who would like to add their product catalogs to the Google 3D Warehouse. 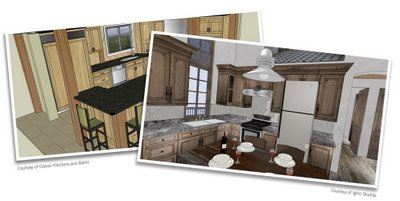 If you haven't already done so, our ever-growing Kitchen & Bath collection of models is worth checking out. Images courtesy Classic Kitchens and Baths (left) and Igloo Studios.